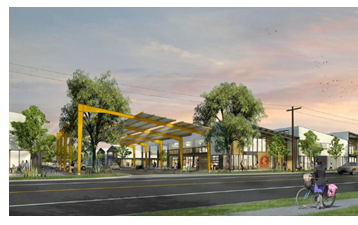 ​​AUSTIN – ​​​The Center for Social Innovation will deliver new office and collaborative space to a select group of nonprofits at Springdale General—a creative office complex under construction on the east side at 1023 Springdale Rd. The Center for Social Innovation in Austin The Center for Social Innovation will occupy six of the 15 buildings—about 60,000 sf. To add more options, The Center for Social Innovation will include a 10,000-sf co-working and meeting space for tenants who prefer that format and vibe. ​Cafe Medici, an Austin-based chain, will add a coffee shop as well as roasting facilities.